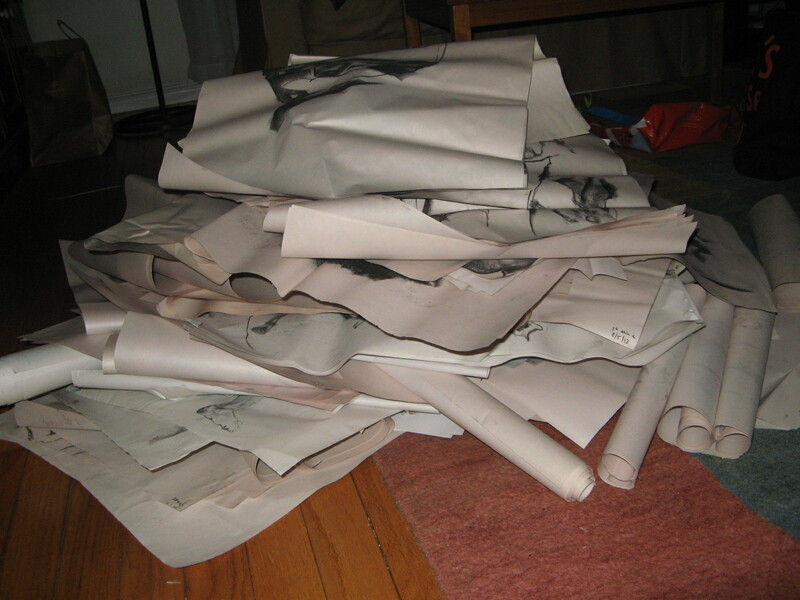 As part of the 40 bags in 40 days de-cluttering challenge, I’ve tackled the backlog of drawings that have been piled, some flat, some rolled, some unceremoniously squashed, in various stashes around my car and home office. They ranged from late 2013 to this past Monday. I went through them rapidly, pulled out the best ones to photograph, put a few of those on the office wall, and put the pile you see here into the recycle bin. There were 44 I deemed photo-worthy, which is too many to post at once, so I’ll post five or six per day over the next several days as part of this online art journal and try to cement in my mind what qualities made these some of the best of the past year’s work. One thing I learn from this overview is that I am generally trying to do too much. The poses in these sessions last 45 minutes at most; the majority are seven to 10 minutes. That’s enough time for me to capture either the overall gesture with relatively little detail, or the details of just a couple of spots. Here, I focused on the hands. Their attitude and the briefest of sketches of the body in between would have been enough to convey the feel of how she is sitting. 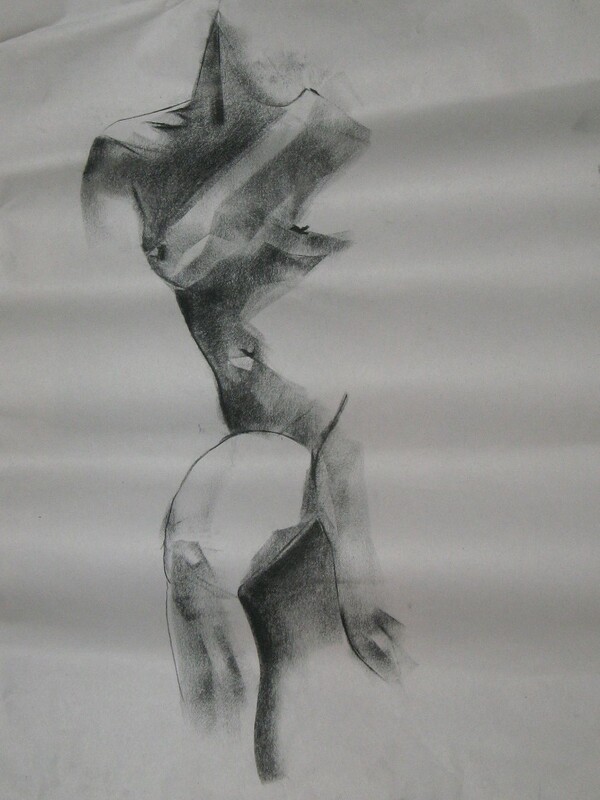 The time I spent on her torso is mostly a diversion. 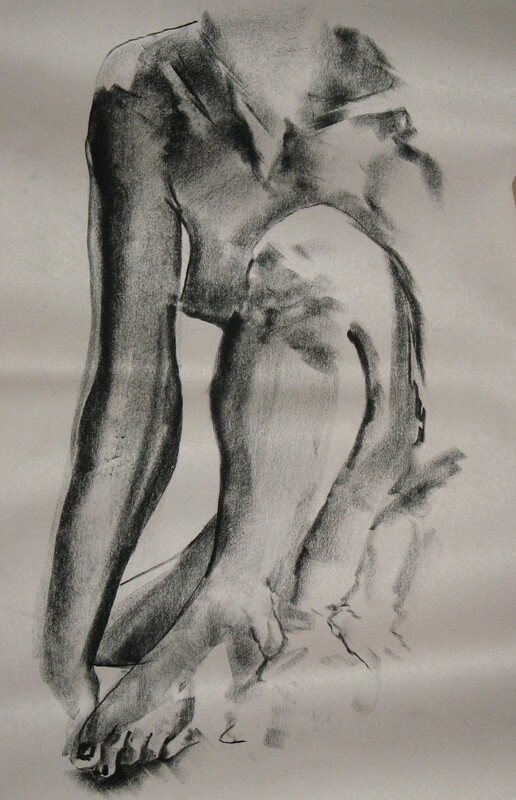 The subtle shading of her lower back is a whole project unto itself, which I couldn’t do justice in 15 minutes, though I did better here than I often do. 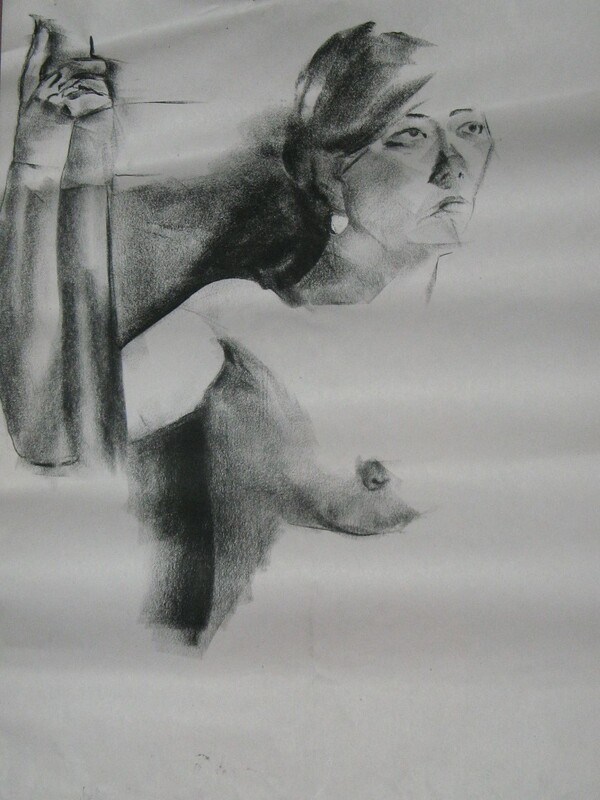 I included the next one largely on the basis of the light across the chest and belly, and the overall gesture. I don’t often spend any time on the hair or face, and took the plunge with this next one. It’s here as a reminder to do that more often. 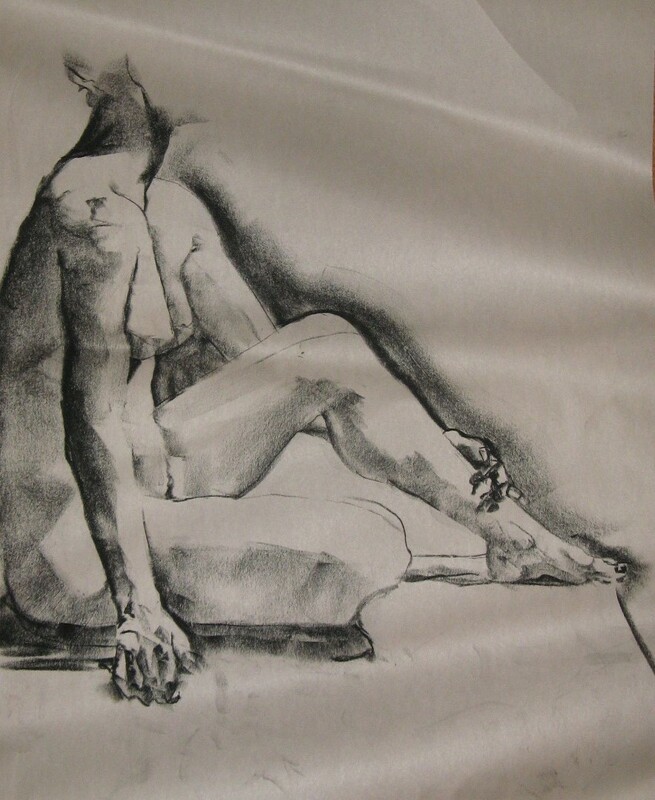 What works in this one is the light in certain places: collarbone, knee, foot. I am often tempted to put slight shading in almost everywhere, which leads me down my oft-traveled road of low contrast. Leaving some of the paper really white is as important as going really dark. 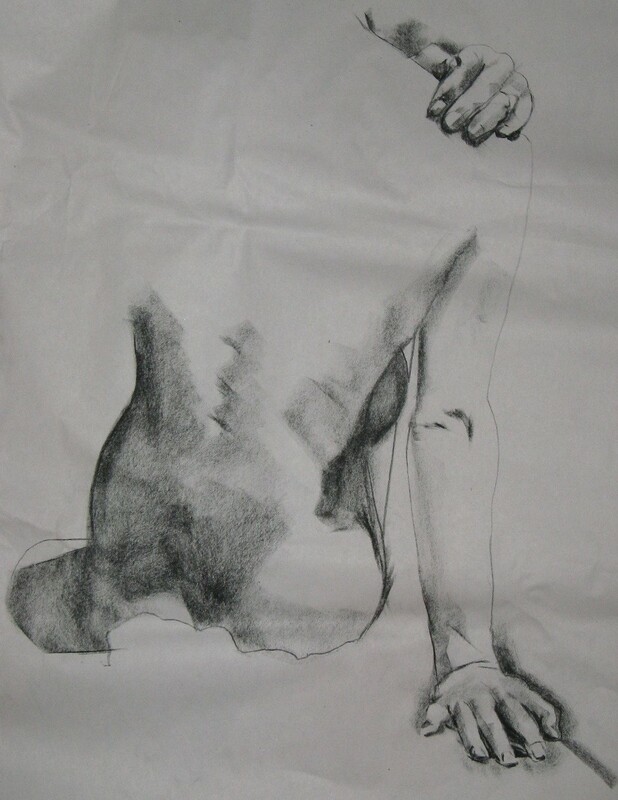 This one commits a lot of the errors that make me want to ball the paper up–it’s stiff, I can see the hesitation in my marks, there are scale problems–but I like the hands, especially the right one, and the light on her right hip. So much to learn, so much pleasure in the learning.